Where has qualitative political communication research gone? In the 1950s, Paul Lazarsfeld pursued the mixed methods fieldwork that enabled him to develop groundbreaking theories of opinion leadership and the two-step flow of communication. At the same time, Kurt and Gladys Engel Lang were pioneering field studies of the first live broadcasts of political parades and conventions, analyzing their effects on spectators and media audiences alike. And yet, despite this body of work, in the ensuing 60 years the study of political communication has largely come to be defined by surveys and experiments that narrowly seek to understand the psychology of voters. Despite the advances quantitative methodological approaches have made for our understanding of political attitudes and behavior, there is a widespread uneasiness in the field that political communication research has not kept pace with the speed and scale of changes in contemporary media, social life, and politics. 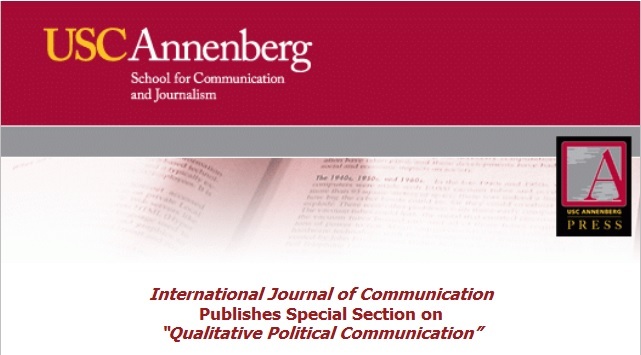 In this Special Section on Qualitative Political Communication, we call for a new era of qualitative research in order to theorize and describe the changing ways that political actors use media, the new technological and social contexts within which citizens consume and share political information, and the ways that political organizations of all stripes are changing in the digital era. Guest-edited by David Karpf, Daniel Kreiss, Rasmus Kleis Nielsen and Matthew Powers, this Special Section features nine original empirical studies and methodological articles that reveal how qualitative work can produce new objects of analysis and understandings of political phenomenon that are close to the lived experience of political actors and citizens themselves. Even more, these articles demonstrate the pressing need for scholars to get out from behind their computers and foray into a contemporary world that looks very different from the assumptions that guided scholarship during the mass media era. We invite you to read these papers published June 1, 2015 at http://ijoc.org.